Lisa Y. Wu talks to Diane and Nick of Royal Collectibles Astoria. 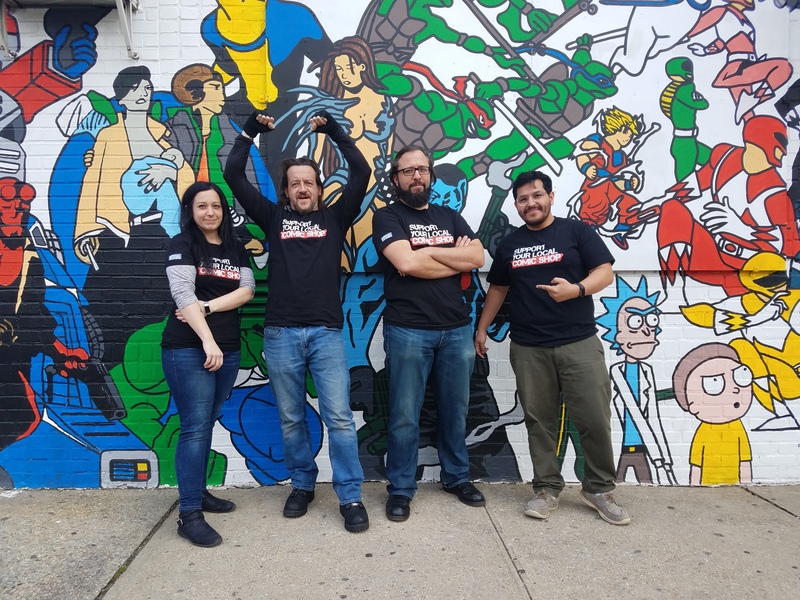 For anyone that follows us on social media – Facebook/Instagram/Twitter or has been to the shop in Forest Hills, you’ll know that we just opened a second comic shop in Astoria. 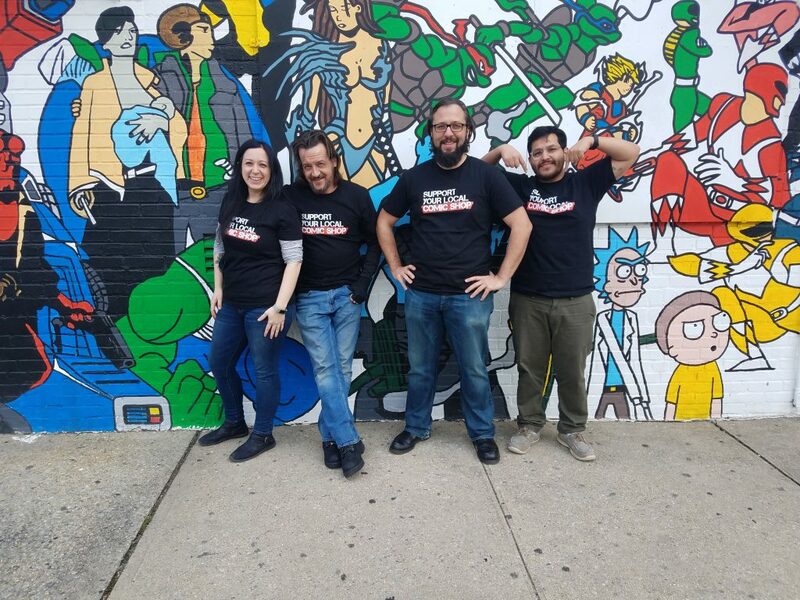 If you only know us through this site, we just opened a second comic shop! We’re very excited to have the opportunity to expand the Royal Collectibles name past Metropolitan Avenue and with so much good will we have received as news broke, we’ve also received many questions. Yesterday we had the opportunity to tell our story. 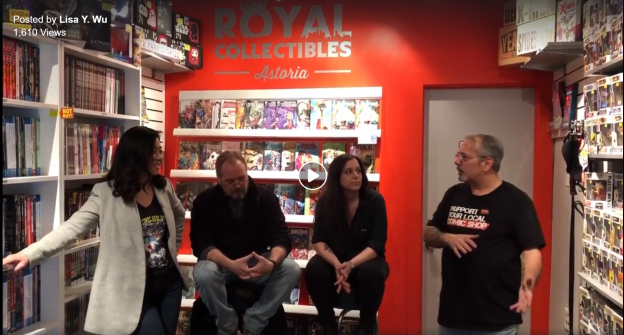 Thank you to Lisa Y. Wu, the newly appointed VP of Sales and Marketing of A Wave Blue World and former Retailer Relations at Aftershock Comics, for giving us the time to talk about Royal Collectibles Astoria through her #MakingStoriesMatter initiative. We were very excited when she reached out to Diane Lazauskas in regards to the project; in telling a new story with such ease and confidence would not be possible it if weren’t for the continued heart that Diane continually puts into Royal Collectibles. If we really want to make stories matter together, it’s the recognition that a vision could only become a reality because of the continual dedication of those that are committed to the brand. We all get to enjoy this friendly neighborhood comic shop thanks to so many great people and many of those great people are YOU! Be sure to follow Royal Collectibles Astoria on Instagram and Facebook, along with Russ Braun on Instagram. Don’t forget to also follow Lisa Y. Wu at @TheWuReport on Instagram and Twitter. 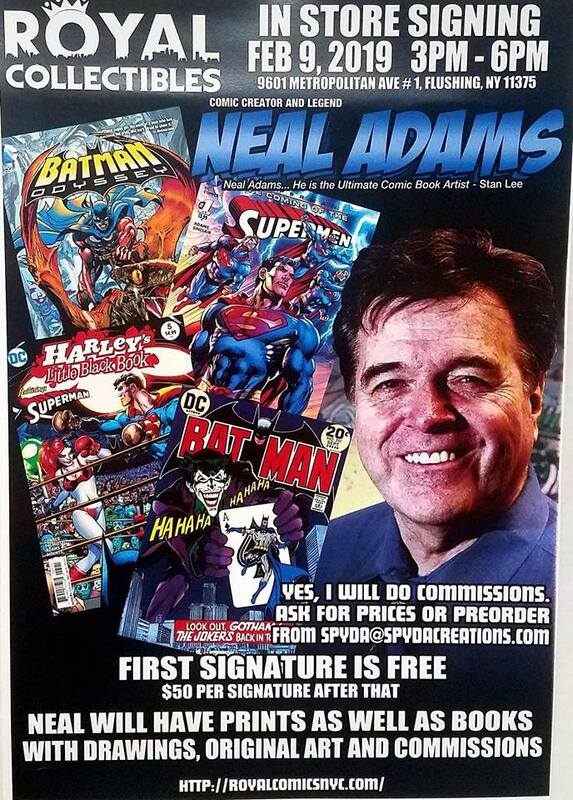 Also be sure to visit Royal Collectibles Astoria at 45-03 Broadway in Astoria, NY 11103. This entry was posted in General Info on March 26, 2019 by admin. 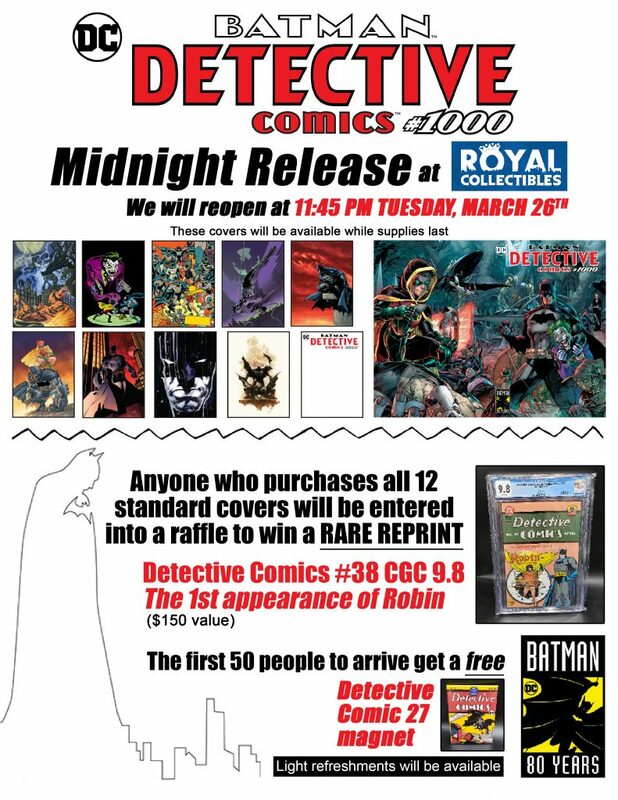 Royal Collectibles will be hosting its fourth midnight release opening for Detective Comics #1000. We’re very excited to announce that our next midnight release will be on Tuesday, March 26th in support of DC Comics’ Detective Comics #1000. 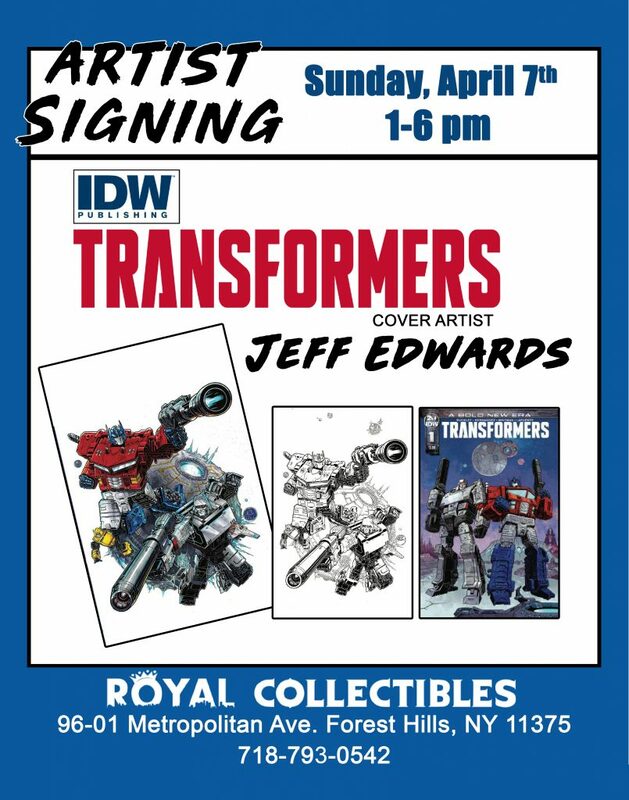 Royal Collectibles will be re-opening at 11:45 pm on Tuesday, March 26th and we will be selling all main 12 covers being offered. 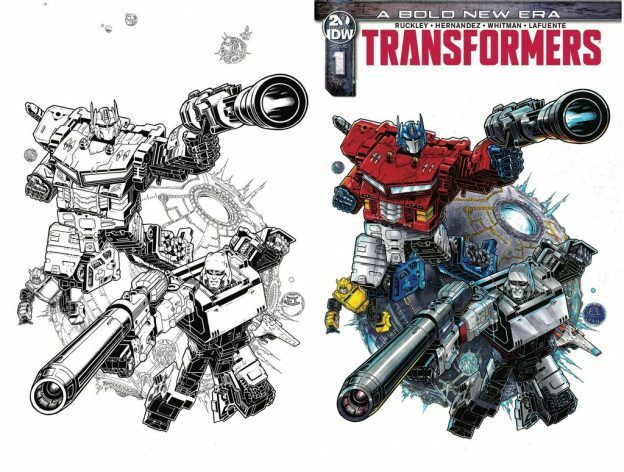 The covers will be available while supplies last. We’ve previously held midnight releases for DC Comics’ Doomsday Clock issue 1, Action Comics #1000, and Batman #50. To mark this special landmark occasion, the first 50 people to arrive will get a free Detective Comics #27 magnet. There will also be light refreshments for all those that attend. So, be sure to mark the midnight release for Detective Comics #1000 on your bat-calendars, bat-phones, or wherever it may be that you take your notes and we’ll see you soon at the same bat-comic shop, same bat-time. Are you excited for the release of Detective Comics #1000? Let us know! This entry was posted in General Info and tagged Batman, Batman Detective Comics, Batman Detective Comics 1000, DC Comics, Detective Comics, Detective Comics 1000, Royal Collectibles on March 11, 2019 by admin. 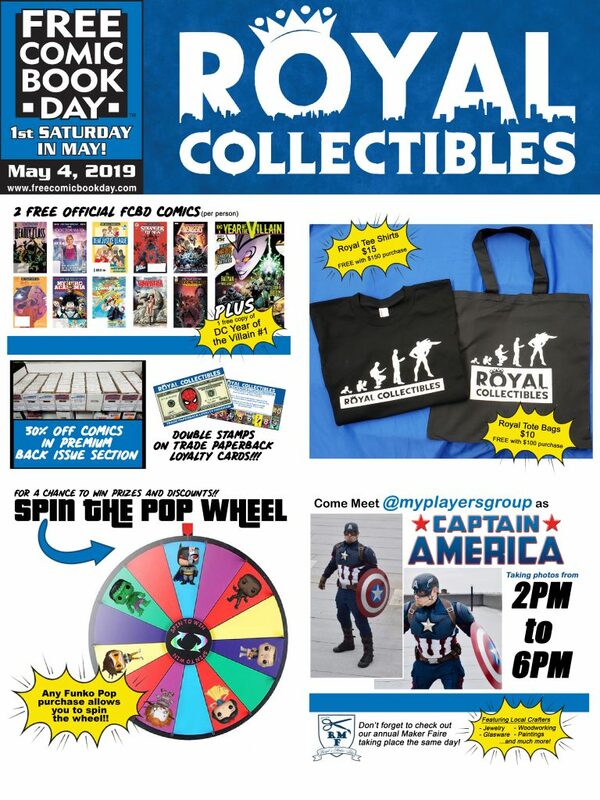 Royal Collectibles to celebrate “Captain Marvel Day” on Saturday, March 16th! 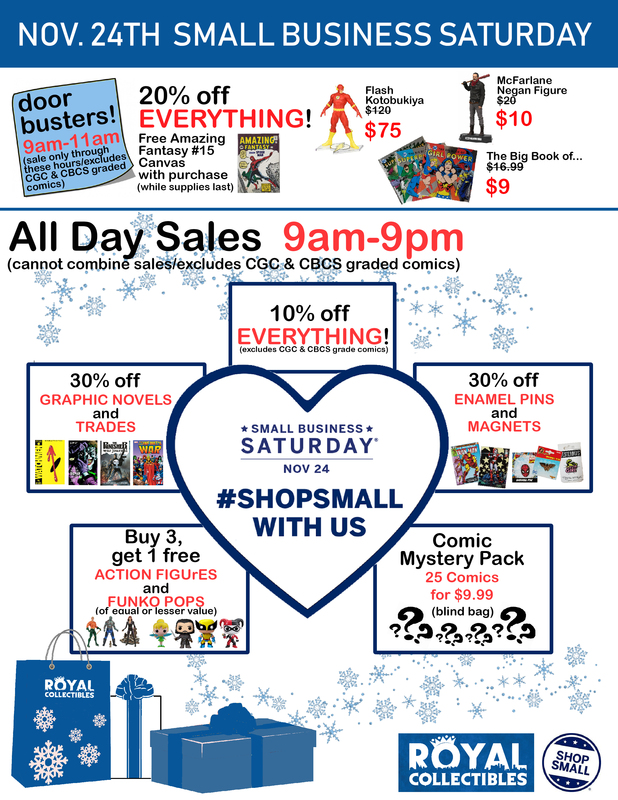 This month looks to be quite the Marvel-ous one for us at Royal and all of our loyal customers. One of the biggest movies in the Marvel Cinematic Universe is opening, Captain Marvel, and we’ll be celebrating it by giving Carol Danvers the Royal treatment – a Captain Marvel Day! On Saturday, March 16th, get ready to go higher, further, faster! 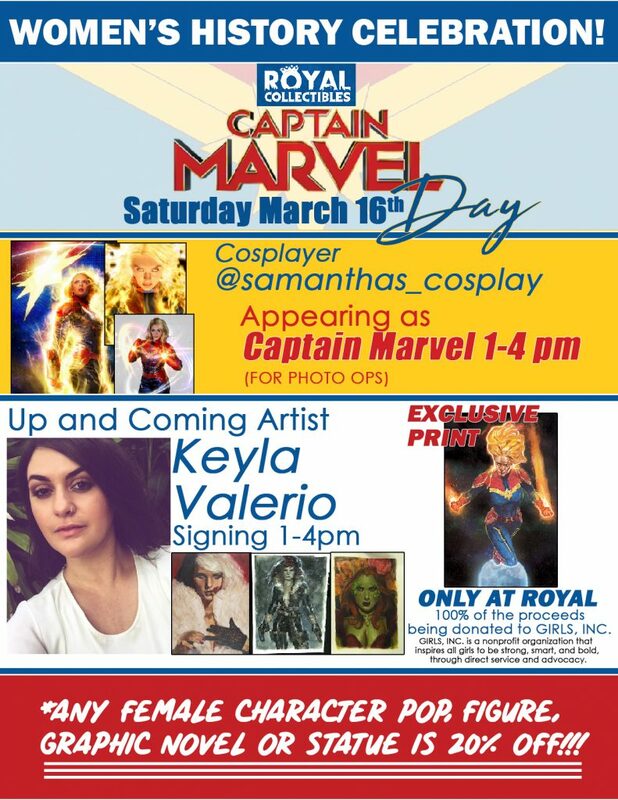 Following the release of Captain Marvel on International Women’s Day, Royal Collectibles will be hosting Captain Marvel Day, the weekend after, which is promising to be one of our most fun events yet! We’re very excited to announce that we’ve collaborated with artist Keyla Valerio on an exclusive Captain Marvel print ($20) that will only be available at Royal. Keyla Valerio will also be here at the shop, signing prints from 1 to 4 pm. 100% of the proceeds will be donated to GIRLS, INC. We’re equally excited about GIRLS, INC. as they are a nonprofit organization that inspires all girls to be strong, smart, and bold through direct service and advocacy. From 1 to 4 pm, Captain Marvel will be appearing at the shop. Professional cosplayer Samantha Leigh Catalano could be found on Instagram @samanthas_cosplay and, as you could see, she totally rocks as Carol Danvers/Captain Marvel. As always, please be respectful and no one wants to see Captain Marvel tap into her binary powers, except when facing skrulls. While we are celebrating Women’s History all month long at Royal Collectibles, we will be offering 20% off on any female character in Funko Pop, action figure, graphic novel, or statue form on Captain Marvel Day – Saturday. March 16th from store hours of 10 to 8 pm. So if you’re looking to catch up on Carol Danvers’ comic book adventures and maybe you even want to pick up a pop of Goose the Cat (she’s female), you get 20% off. Or maybe you just want to check out Mariko Tamaki’s masterful run on She-Hulk, that’s 20% off, as well. That’s what we’d call Marvel-ous and Sensational! We hope to see you all on Captain Marvel Day (Saturday, March 16th) as it will certainly be a lot of fun. Be sure to check out the “Upcoming Events” section for the latest on what’s happening this month at Royal Collectibles and be sure to follow us on Instagram, Facebook, and Twitter. 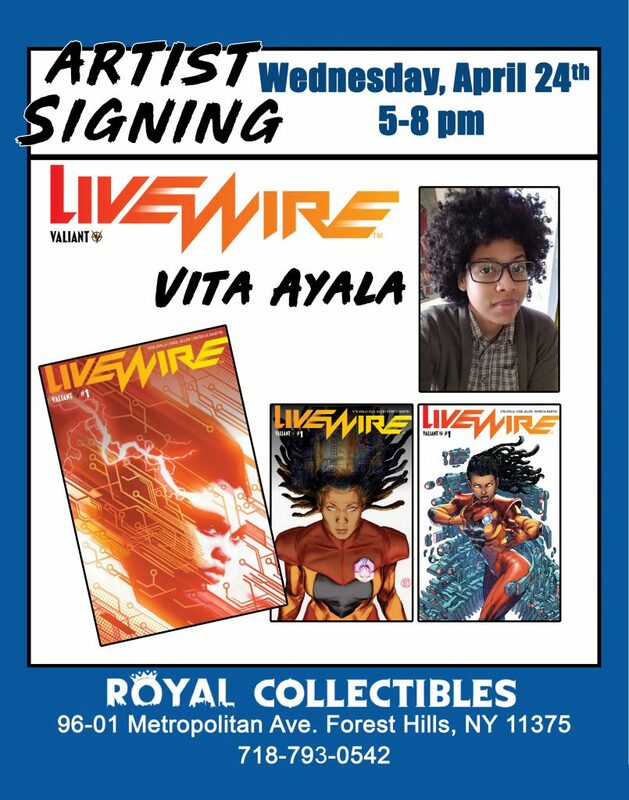 This entry was posted in General Info and tagged Captain Marvel, Captain Marvel Day, International Women's Day, Keyla Valerio, Royal Collectibles, Women's Day, Women's History Celebration, Women's History Month on March 6, 2019 by admin. 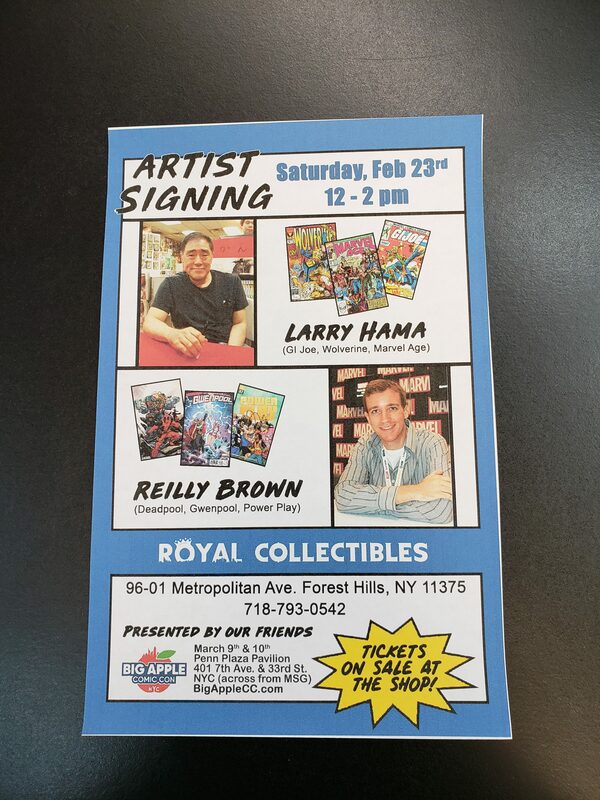 Larry Hama & Reilly Brown Signing! This entry was posted in General Info on February 18, 2019 by admin. This entry was posted in General Info on November 21, 2018 by admin.